I was pushing the polygon count on my machine with this render, having a mini play with some seriously smooth organic shapes. It turns out the torus knot has some very interesting mathematical properties that you can tweak to create some great shapes. I was trying to create a flower of some sort, after making the outer burgundy layer. The petals around the edge were originally meant to be leaves, but they came out looking like petals. 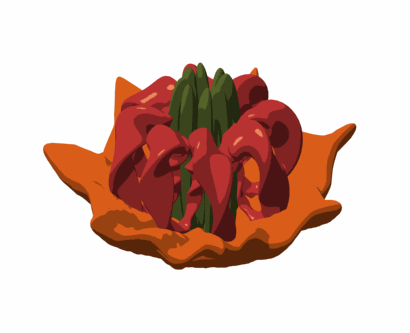 I was playing with simple textures at the, it looks pretty lively with some cartoon shading and bright colours... thats why I called it the Pepper Flower.